With a bachelor’s degree in marketing, she coordinated the Business Incubator of the Scientific and Technologic Parc “Technopolis” since 2007. 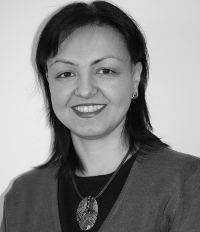 Gabriela is a project manager of the Enterprise Europe Network and she coordinated the network activity in 6 Moldavian counties: Iasi, Suceava, Bacau, Vaslui, Botosani and Neamt. Moreover, she has a vast experience in business consultancy, european funding, intellectual property and organizing economic and brokerage missions, In the past she was a regional consultant and a specialist in the development of 8 projects regarding european funding in tourism, the environment, rural entrepreneurship and others. In addition, she is a lecturer, a trainer of trainers, ability assessor, auditor in the quality domain and a member of the Commission of Authorizing Providers of Professional Development of Adults in Iasi County.